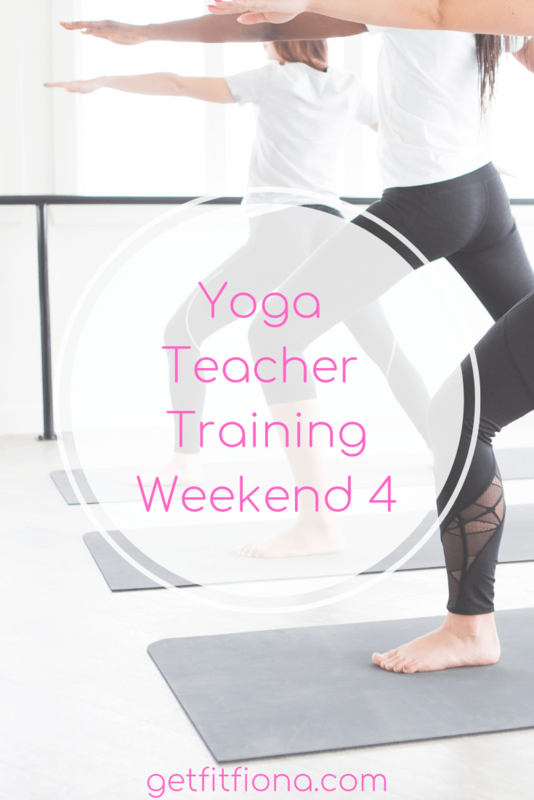 Today I’m sharing a recap of my fourth weekend of yoga teacher training. We started off the weekend of yoga teacher training with a practice followed by talking about 15 different poses. The practice was such a good one for me. It just felt really good and I was in the zone the entire time. It’s been awhile since I last had a practice that was that good. Needless to say, I really appreciate them when they happen. The poses we discussed were pretty basic ones that are done is a lot of practices. It was nice to talk about all the little details of them – everything from cuing, benefits, and variations. One thing I’m learning is that there’s no “one way” to do a yoga pose. We’re expected to learn all of the sanskrit names of the poses. I’m very grateful that the studio I used to practice at used a lot of the sanskrit names so I’m at least familiar with them. Some of them are pretty tricky for me to say. We went over the anatomy of the abdominal muscles on Saturday morning. It was great to get a refresher on the core muscles. My anatomy class in university was three years ago already. There’s so many little details to know, so it was great to hear it all again. The core is such an important part of the body in nearly all yoga poses. The second half of the morning was a practice focused on the core. It was really tough! My core is still sore today, two days later. I really like that we’ll almost always do a yoga practice focused on the body parts that we talk about. We discussed a few more poses that we couldn’t get to on Friday night before breaking into small groups and talking about centering, warm ups, and sun salutations. We were told that we were going to be teaching each other for 10 minutes on Sunday afternoon. Hearing about what my group members liked when it came to the first 10 minutes of a yoga class was really insightful. I got some really good ideas from them about what they like to get out of the beginning of a yoga class. We spent the morning focused on anatomy again. This time we focused on the muscles of the back. It was a good reminder of just how many muscles are in our backs that make movement possible – from flexion and extension of the trunk, bending side to side, and even keeping us upright. We finished up the morning talking about vayus. I had never heard about them before, so it was great to learn about them. There;s 5 inner vayus and 5 outer vayus. We’re focusing on just the 5 inner vayus in our teacher training. I think most of us were pretty nervous about the Sunday afternoon session because we knew that we would be teaching each other in small groups. We got together again in out small groups and taught each other for about 10 minutes, focusing on a few minutes of centering, a few minutes of a warm up, and a sun salutation A. It clearly wasn’t a lot of teaching to do, but I was still pretty anxious about it. I volunteered to go first in my small group, and I’m so glad that I did. It felt good to do it and have it done. I had written down a bunch of notes just in case I got lost, and that was really helpful. It actually went pretty well (better than I was expecting) and I got some great feedback from my group. I need to work on my transitions. They really liked my centering that focused on the breath. I went into this weekend of teacher training knowing that we would teach for the first time, and I was really nervous about that. Now that it’s done I built it up into this big thing. Honestly, the lead up to teaching was worse than actually doing it.